Canada’s federal, provincial and territorial governments routinely and significantly miss their budget targets. They also do so in a predictable manner, with spending and revenue often coming in higher than projected within their budgets. In this edition of Graphic Intelligence, we look at how, over the past 15 years, senior governments’ cumulatively overshot their planned spending by $69 billion. Revenue overshoot over the same period was even larger, totaling to a bit over $104 billion. 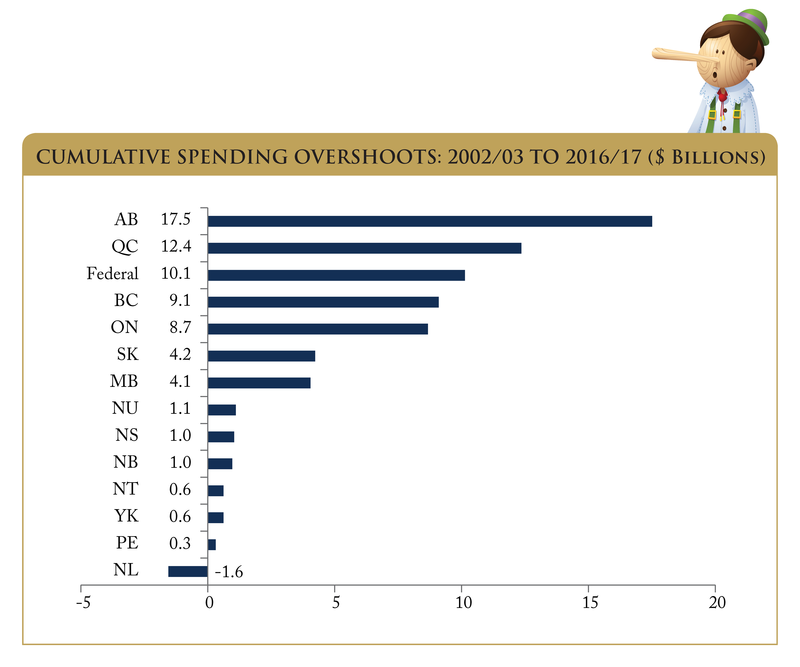 Alberta has the highest cumulative overshoot of $17.5 billion over the past 15 years, which amounts to 32% of its planned spending for the 2016/17 fiscal year. Governments in Canada are spending and taxing far more this year than they would have had they delivered on their past budget commitments. To learn more about the fiscal accountability of Canada’s senior governments, read “Blown Budgets: Canada’s Senior Governments Need Fiscal Control,” by William B.P. Robson and Farah Omran.